School might be in session but don’t tell that to Longs Peak. People are playing hooky from work and school in order to scale this mountain. Conditions are great and the Keyhole route has returned to non-technical status. Although another large storm could change things quickly, climbers continue to hedge their bets and set their sights on the summit of Longs Peak at 14, 259 feet. 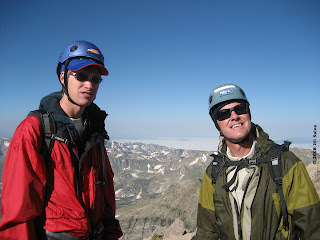 Jim and Alex Ritter were all smiles when I met them at 1 am for our recent ascent of Longs. 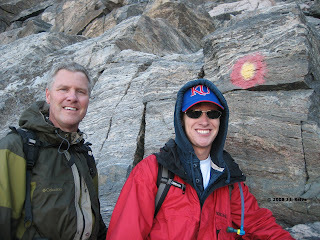 More than half-way through the trip this father-son duo from Omaha, Nebraska were still beaming as we passed below one of the well-known bulls-eye markers. These men put in a strong effort, achieving a new personal altitude record. Congratulations Jim and Alex! Way to go! Thursday I was up in the Notchtop - Little Matterhorn Cirque in Rocky Mountain National Park. This area sees little foot or climbing traffic compared to Longs Peak. We had the entire area to ourselves. Notchtop's alpine routes are good. The lesser known Little Matterhorn and Gabletop have routes with surprisingly solid rock. 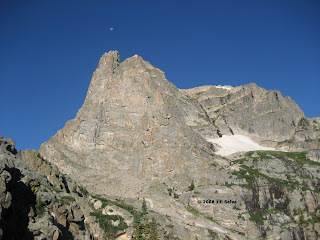 By the time we reached Two Rivers Lake on the approach, we were treated to a plump moon hanging over Notchtop Mountain. Even though this was a waning moon, it got me thinking about the magical properties of full moons and how much time I spend out climbing under the various phases of the sun and moon. After some reading, I learned that Native Americans often refer to the August full moon as the “Green Corn Moon”. http://nativeamericans.mrdonn.org is an interesting web site that contains free resources, teaching tools and lesson plans for teachers.